This spot is deep at the roots of blues history, though most people have never heard of it. The blues had to come from somewhere. Musically, you can trace the influences, but when did the blues actually become the blues? And where did they surface as the blues? Most people would say sometime around the turn of the century, in the Mississippi Delta. From there, the seeds blew out all over and fertilized music scenes everywhere, from Chicago and New York to England and South Africa, even Japan and China. The blues had been forming in a rich stew of influences up and down the Delta. This was their first contact with someone who wrote it down. So what does it mean, "where the Southern cross the Dog?" Ken's pointing at it right here. Another railroad, the Yazoo Delta, was more popularly known as the Yellow Dog. 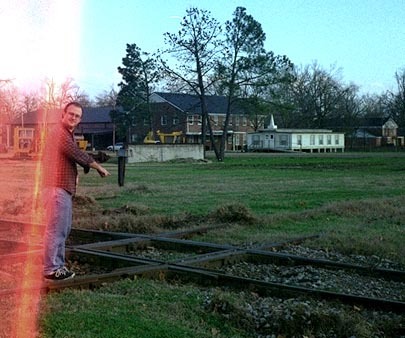 The Southern tracks crossed the Yazoo Delta railroad in Moorhead, MS.
That's "where the Southern cross the Dog." 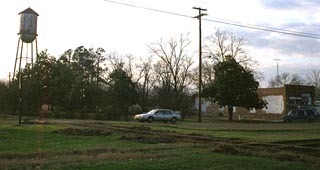 The site has been preserved, even though the Yazoo Delta rails today end about 50 yards in either direction from the old-fashioned crossing. 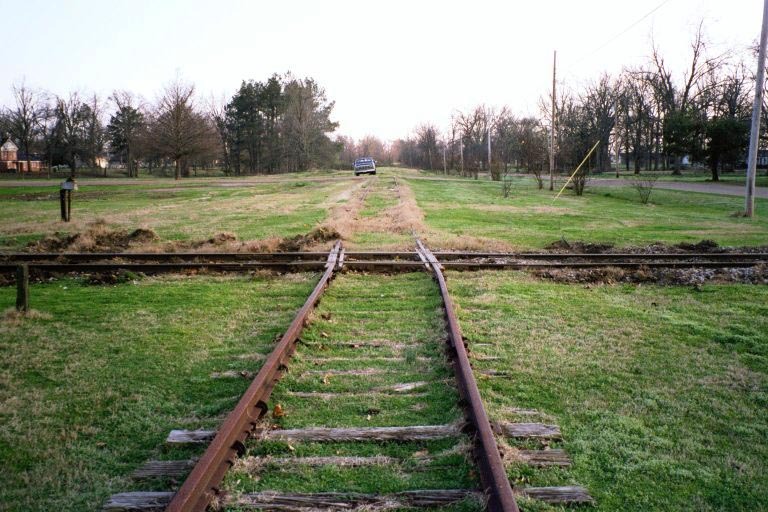 (Railroads don't use crossings like this anymore; they're very dangerous, as you might guess.) The Southern rails are still in use, and we saw train cars being moved back and forth while we were there. Simple directions for finding the crossing: It's about 75 feet from the Moorhead, MS, post office. If you find the post office, you can see the crossing from there (it's just past the gazebo). Or you can just follow Highway 3 south from the 82 until you hit tracks. The tracks that cross the road here are the old Southern, as you'll see from the names of the streets running on either side of the tracks (N. and S. Southern Ave.). 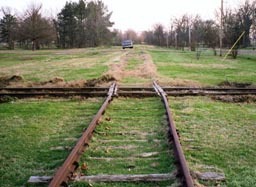 The signpost with the missing sign is just south of the tracks, on the right as you cross them. At the intersection of Highway 3 and the tracks is the Yellow Dog Cafe, where you should be able to find someone who can point you toward the crossing, about 100 yards away--between the historical marker and the water tower you see in the distance. 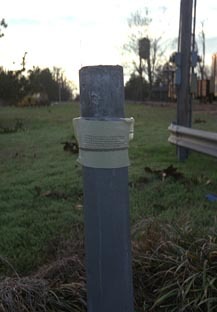 Enjoyed your info on the spot where the "Southern crosses the Yellow Dog". But, It's the Illinois Central (the old Southern) railroad, running north and south that no longer exist. The Yellow Dog, now the C&G, or Columbus & Greenville railroad is still in use. 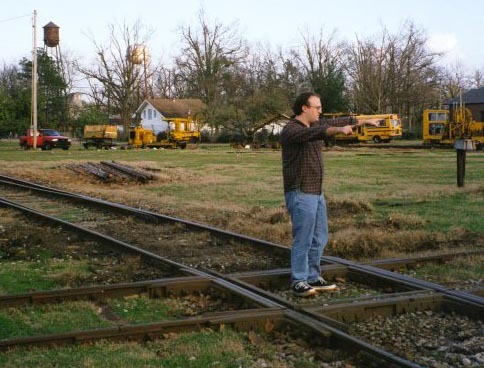 The Yellow Dog or Yazoo/Delta (YD) Railroad got its nickname from one of two sources, or both, historians aren't sure. First, either the YD locomotive or the box cars, or both, were painted yellow, hence The Yellow Dog. Another story tells of someone's old yellow dog that used to chase the YD through town barking at the wheels. One thing that's certain. At one time it was a pretty famous junction with as many as six trains a day meeting there with their cattle catchers touching. An oft repeated story from WWII veterans says that if someone from Mississippi, especially the Delta, went into a large gathering of soldiers and wanted to see if there were any home folks around they would simply holler out "Does anyone know where the Southern crosses the Yellow Dog?" an affirmative answer would usually produce a kindred soul. long as they remained sober and gave an honest day's work. He also built one of the first, if not the first, school for black girls in the state. Much of this was taken from the History of Sunflower County "Fever, Floods, and Faith" by Marie Hemphill (I have a few photos in the book, brag) and many long discussions with the former, long time editor of the Indianola paper. Joe is right, of course, about which tracks are still in useit’s the east-west tracks that still run, not the north-south tracks of the old Southern/Illinois Central. I note that you indicated the Southern was still running but changed it after e-mail from Joe Wilson. But I think Joe Wilson (strangely for a local) is wrong and you were right. The old Southern is still running and the Yazoo Delta is gone. I think the confusion is caused by the fact that the Southern (a railroad in the southern area) runs east-west and the Yazoo Delta ran north-south. The current Moorhead road map clearly show N and S Southern Ave running east-west and E and W Delta Ave running north-south. Also the YD ran between Tutwiler and Yazoo via Moorhead which was directly north-south. I am afraid I have a long way to come (from England) to verify it. I did the New Orleans  Memphis  Nashville trip in 2004 alas before I developed a much stronger interest in the blues. Think I drove through the delta and missed it all. If you check a good dictionary, youll see that a yellow dog contract in labor history is a contract that a worker signs where he agrees not to join a union. The implication here is that only a yellow dog would do such a thing to get employment. Yellow Dog is a mild pejorative from about the same period (yellow is itself an insult, from yellow journalism to the implication that someone whos yellow is a coward; adding a dog to it rounds it out nicely). Ive also heard the phrase yellow-dog Democrat, which (forgive me if I get this not quite right) describes a person who, if the only candidates on a ballot were a Republican and a yellow dog, would vote for the dog. Nicknaming the Yazoo Delta was probably a fond local amusement that had to do with all the usual things people grumble about: poor service, low wages, general incompetence, whatever. Apparently the phrase where the Southern cross the Dog and the blues legend about the spot figure prominently in August Wilsons play The Piano Lesson. I havent seen it, so I cant tell you how they fit in. Its supposed to be a good show, though.